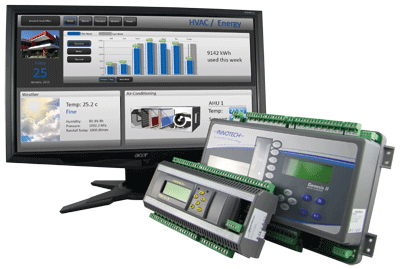 Our Building Automation controls for HVAC and Energy Management systems are built to be reliable, accurate, and to exceed expectations. The built-in flexibility of Innotech's control systems enables you to meet the challenges and demands of an ever-changing world, while at the same time offering unique user benefits that provide you with optimum plant performance and excellent life cycle costs. Find out how we can help with your application or industry. Our new range of digital controllers. Innotech's high performance Direct Digital Controllers (DDCs) are rugged, built to last and designed to enable precise control in even the harshest of environments. Our scalable and intelligent peer-to-peer controllers are intuitive, highly accurate and fully programmable, with easy-to-use operator interfaces - providing a powerful, robust and cost-effective solution to a host of control applications. Innotech's stand-alone HVAC controls are a simple, easy-to-use, cost effective solution to a host of control applications. These purpose-built air conditioning controls are simple, manually adjustable and robust. Designed to be used in conjunction with Innotech’s range of digital controllers, the premier software packages are simple yet powerful, save 50% engineering time, and have a graphical user interface. How Innotech helps you save money and limits unwanted surprises. The reason for wanting or needing a Building Automation System (BAS) / Building Management System (BMS) is to have centralised control and monitoring of connected equipment, as well the ability to implement strategies that inevitably save a client money. Building owners, facility managers, and specifiers (consulting engineers) often make decisions on the acquisition of a BAS/BMS from the capital outlay, which is usually clearly defined. Many manufacturers ensure they have a lower initial cost to win the bid (buying the job), and then create a technology lock which holds the client to ransom with exceptionally high annual service & maintenance costs. These ongoing costs should also be considered during the review process if the best outcome for the client is to be achieved. The process of identifying and documenting all the costs involved over the life of an asset is known as life-cycle costing (LCC). By choosing an Innotech Control solution, you get a competitive, reliable and complete solution, with no technology lock. All your costs can be discussed and agreed upon, ensuring there are no surprises down the track, ensuring you, and your client have a good ongoing relationship for the complete life of the product. Contact us to learn more about our market leading life cycle costs. Innotech cater for small stand-alone HVAC systems right through to multi-campus education institutions, hospitals, pharmaceuticals, and council buildings that may require a full Building Automation, Energy Management and HVAC control solution. Innotech solutions are the only choice for specifiers who want to have a good ongoing relationship with their client after the project is complete, or for those who just want to ensure the solution is simple to use, but flexible enough to meet the demands of their HVAC, Energy and BMS projects. Don’t make the mistake of locking in your client to a system where they have no control. Make sure "when they buy the car, they get the keys too." Innotech put the control back in the hands of the client. See some of the projects we have worked on. Energy Management capabilities are a key consideration when selecting a Building Automation System (BAS) / Building Management System (BMS). Therefore any proposed system must be capable of integration with industry standard protocols such as BACnet, Modbus, KNX, M-bus and many more. This enables the BAS/BMS to receive complex amounts of data over a single communications bus, for example 1000 points may be transmitted on 2 wires, rather than a single piece of information on each individual wire connection. This High Level Integration (HLI) enables the BAS/BMS to perform additional strategies (I.E. Control or Alarm Notifications) based on this high level data. Typical HLI’s may include: Energy Meters (Smart Meters), Chillers, Variable Speed Drives (VSD’s), Thermal Energy Meters, Weather Transmitters and many more. The Innotech solution not only makes this style of integration simple and cost-effective, but we can also incorporate a Building Services Reporting and Analysis utility within the BMS. This utility is known as ATOM, which creates a complete Building & Energy Management System. (BEMS) Incorporating ATOM into your solution allows strategy changes to be made quickly, and the results of the changes analysed immediately, and from within the same utility. Many manufacturers use third party reporting solutions which increases the cost for implementation, training, and can take additional time to analyse the data. This can cost valuable time and money. When you choose an Innotech BEMS, you have the added benefit of no-ongoing licensing fees for your software and hardware, ensuring the life cycle costs are extremely attractive for any client or facility manager. Learn more about ATOM Software. Innotech's inventory of high quality HVAC Controls and Building Automation products is used in a broad range of applications and industries such as; telecommunications, medical and pharmaceuticals, education, government, farming, hotels, sporting venues, mining and transport. The flexibility of the Innotech range ensures the product is suited to almost any application. If your application is not shown, please contact Innotech to discuss your requirements, as we believe we will have an off-the-shelf solution that can be programmed to suit your specific needs, and we will enjoy the challenge. A wide range of organisations have chosen Innotech for their preferred solution provider. See our customers to learn mores.